LuxuriousPROTOTYPE: Knockaround Sunglasses | Quality for a Great Cost. Knockaround Sunglasses | Quality for a Great Cost. 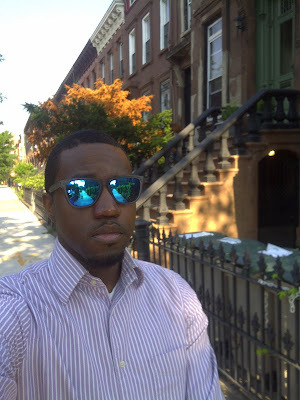 So my new obsession has to be the Knockaround Sunglasses (@knockaround). You ask why? Well let me tell you! For one thing, I love wearing sunglasses however, I tend to misplace them pretty easily. The reason why I like Knockaround so much is because they are sturdy quality sunglasses but at a price point of $14! That beats the little sunglass stations on side of the street (New Yorkers you know what I'm talking about). Also, the frames and lens come in all types of colors. I was introduced to these sunglasses at @GlamazonDiaries Glamazon Summer Social on Wednesday July 6, 2011 at Alma G Salon & Spa. Get this, there is even custom frames, for only $34. You can choose the color of the front, left arm, right arm and lens. I personally like to where mine with my business/business casual clothes. It's a good way to introduce some fun into business. Knockaround started in 2005 when Adam “Ace” Moyer moved from the Virginia suburbs of Washington, D.C. to San Diego CA, hoping to strike it big as an artist. Like most transplanted East Coasters, Ace soon became enchanted with the perpetual sunshine and laid-back attitude of Southern California. Within the tight quarters of his astro-turfed art studio in La Jolla, Ace started Knockaround, a down-to-earth sunglasses line specializing in classically designed shades offered in a full spectrum of colors. In 2008, Ace’s operation moved out of the art studio and into his garage, and that fall, Knockaround launched its Premium sunglasses in 4 colors. Today, the Premiums are available in 24 colors, with new colors added every few months. Each pair is stamped with the company mantra: ACE ON BASE. Today, Knockaround continues to expand with new colors and new models. Each Knockaround product goes through a standard checklist of qualifications: classically designed, affordable, and offered in a full spectrum of colors. Operations have moved once again, this time out of the garage and into a warehouse just 1.5 miles from the Pacific Ocean. Stay tuned, Knockaround has big things in the works. Ace on Base.